What is a normal dog weight? What is the Largest Dog Weight? What can cause weight loss in dogs? What Causes Severe Dog Weight Loss? Portion size and dog weight – how much should you feed your dog? Pregnant Dog Weight Gain – What Is normal? Maintaining a healthy weight is so important for dogs. Obesity in dogs can lead to serious health issues, many of which are painful and some which will ultimately reduce your dog’s lifespan. An overweight dog can lose weight by following the same basic principals that humans do: increased physical activity and a suitable diet plan. This isn’t as difficult as it might sound, thanks to the fact that there are now many weight loss and weight management dog food’s available which contain ingredients that are low fat. Other people choose to create their own home made diets using cooked and raw foods. Whatever choice you make to help your dog to lose and maintain a healthy weight, it needs to be consistent and combined with enough exercise to promote weight loss. This in turn will lead to a healthier, happier, longer-lived canine family member. Every individual dog is different – just like people! There are many weight management and weight loss dry food options for dogs. And if you’re one of those people who have been recommended to feed your overweight dog a purely dry food diet or prescription dry formula, you’ve probably researched about the potential downfalls and risks involved. True, there are some really sad stories and legitimate concerns out there of dogs who have had a decline in health after being on dry-only diets. Thankfully, there are also wet or canned foods available that are specially formulated for weight management. You can use these alone, or combined with a quality dry food. This big guide covers the very best canned food options for dog weight loss and maintenance, as well as a guide to healthy dog weight. There are several varieties of Wellness Core canned dog food, but Weight Management Formula is the one we’re focusing on here. Iron Proteinate, Zinc Proteinate, Sunflower Oil, Choline Chloride, Vitamin E Supplement, Cobalt Proteinate, Copper Proteinate, Manganese Proteinate, Sodium Selenite, Thiamine Mononitrate, Biotin, Vitamin A Supplement, Potassium Iodide, Vitamin B12 Supplement, Vitamin D3 Supplement, Riboflavin Supplement. This meal has been formulated for dogs who are either overweight, or don’t get a lot of exercise. It’s designed to have a ratio of protein to fat that encourages fat loss without losing all important muscle. Both Lite and Weight Management are available in dry and canned varieties. So what’s the difference between the two and which would be ideal for your overweight dog? Weight Management – ideal for dogs that are not overly active and thus at risk of putting on weight. This is basically a lower calorie food for dogs that have trouble wearing off calories. Nutro Weight Management is available in two specific formulas depending on the breed of your dog: small breed and large breed. Nutro Adult Lite – Assists in weight loss for dogs that are already obese or overweight. One of the most important aspects of both of these weight loss foods is that they have been developed to include the right amount of fiber and protein to contribute to a feeling of fullness in your dog, without loading them up on high calories and carbohydrates which would ultimately lead to weight gain and poor health. The fiber and protein rich food results in a dog consuming less food overall, and thus makes it considerably easier to manage their weight. Knowing what exactly is in commercial pet food can be almost impossible nowadays, and often even the manufacturer’s themselves are not always certain of the origins of all of their ingredients. So one of the more reassuring aspects of Nutro dog food is that the company says that they purchase each individual ingredient directly, and can trace every ingredient back to the original supplier. Nutro also chooses to completely leave out the “filler” type ingredients that many pet owners are concerned about due to possible allergy risks, and just plain poor nutrition. These include corn, wheat, rice flour, chicken by product meal and other controversial ingredients. Nutro also has a policy not to include any artificial preservatives, colors or flavors in any of their foods. This is a nice chunky food and is not pastey or like a pate (every dog has a preference but many love the chunks). You can see whole pieces of carrot, peas and corn and it looks like a blend that’s home made – very natural and high quality. Life Stages has been made for dogs that are either overweight or senior (or both). You won’t find any of the common fillers in this food. No wheat, corn, soy, or other filler ingredients. The main meat proteins are chicken, lamb and fish (herring, which also contains omega-3 healthy oils), as well as egg for protein. Vegetable ingredients are extensive and also include important vitamin and herbal extracts, resulting in a natural formula that’s focused on helping less active dogs retain muscle while avoiding fat gain. Canidae Life Stages food is made in the USA. With meat by-products as the first ingredient, the Pedigree canned food is not considered as high quality as most of the others listed in this guide. That’s not to say it’s a bad food – for people on a lower budget this is a choice that provides sufficient quality for most dogs to enjoy. Many people choose to use it in conjunction with other foods rather than as the only product in the diet (this is ideal regardless of which weight management food you’re feeding). As an example of one of the most popular small dogs, the normal adult Pomeranian weight range is between 3 and 7 lbs, or 1.36kg and 3.175kg (American Kennel Club standards). 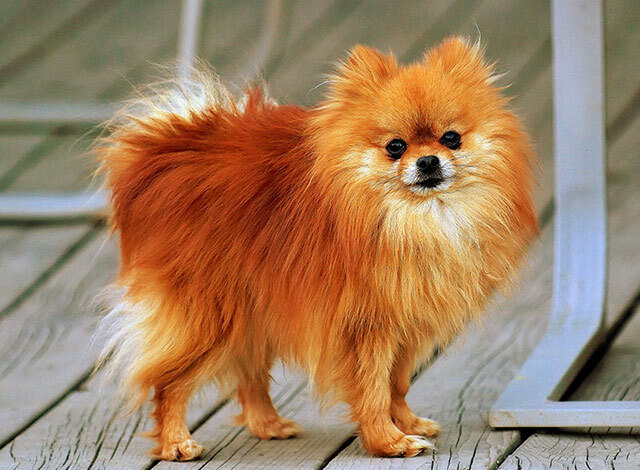 Pomeranians generally reach their adult weight at around one year of age. This relatively large weight range, for such a small dog, takes into consideration gender (females are generally heavier), and the variances in bone and body structure that can occur in a Pomeranian. A healthy adult of this breed should weigh within the three and seven pound weight range. Anything outside this at either end of the range can be a cause for concern, and warrants a visit to your vet. 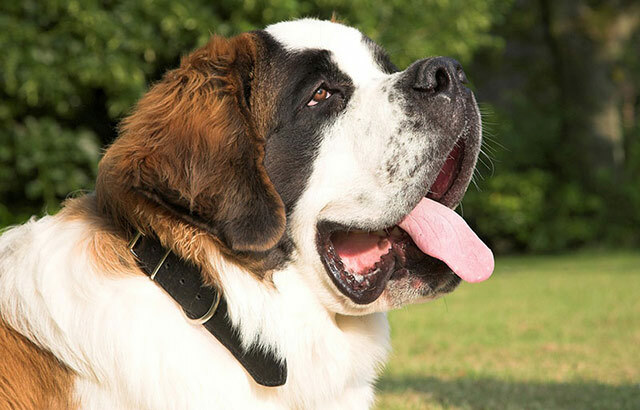 What are the heaviest breeds of dog in the world? The biggest breeds of dogs might be tall and lean like Great Danes, whilst other big dogs may be much more solidly built. Some of the largest tall breeds of dogs include the Scottish Deerhound, the Irish Wolfhound and of course the Great Dane. The minimum weight for a Great Dane is around 100 lb or 45kg (females), however they can get significantly heavier than this, sometimes up to 190 lb. Keeping track of your beloved dog’s weight means that you are concerned about their health and wellbeing. If your pooch is already overweight then it is important to be able to regularly weigh him or her, and to keep a record of their weight over time. This type of accurate record keeping will also be highly valued by your dog’s vet. Even though your vet is likely to weigh your pet whenever you visit, having your own personal records means you can share any weight fluctuations during the time period when you didn’t visit the vet. Your vet will appreciate your proactive approach to maintaining the ongoing health of your beloved pets, and she will be able to use your data as part of your animal’s veterinary records; this is invaluable data which can be used over time to monitor just how your pets are gaining or losing weight. Whether you have a dog, cat, bird, rodent or almost any other pet (or a combination of many! ), having an accurate set of scales at home that allows you to monitor your furred, feathered or scaled friends weight will result in you being able to create and modify their diet and exercise plans according to their needs. Your vet will also appreciate your proactive approach to maintaining the ongoing health of your beloved pets, and she will be able to use your data as part of your animal’s veterinary records; this is invaluable data which can be used over time to monitor just how your pets are gaining or losing weight. The key ingredient is a top quality set of scales. Because many animals are relatively light, good scales for pets need to be extremely accurate, since only small fluctuations can indicate possible health concerns – especially in the case of birds and very small mammals such as rodents, kittens and puppies. 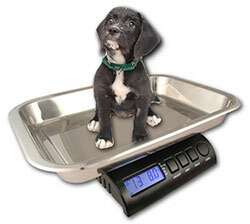 The type and model of scales that you need will of course depend on which pets you have. Those who keep small animals have a good range of choices, whilst those keeping larger animals may need to spend a little bit more, however the benefits can certainly outweigh the one off investment in quality scales for medium to larger animals. The type of scales you need will greatly depend upon the breed of your dog. Tiny dogs will require scales that give very accurate readings at smaller metrics, while the largest dogs will often require scales that are designed for farm animals. For many people, something in between will usually cover your needs very well. Since only small fluctuations in weight can indicate possible health concerns – especially in the case of birds and very small dogs, the accuracy of the scales you use is a most important factor. 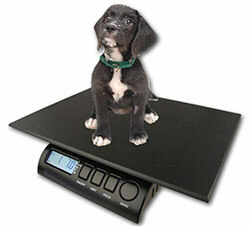 This scale is great for larger animals, including livestock and large dogs. It features a large sized stainless steel platform which is easy to clean. Also included is a non-slip rubber mat, so you can choose to use the scale either with or without it. This is a serious scale for those with heavier needs, including vets and farmers. The scale may also be used for smaller farm animals such as small pigs, goats, lambs and llamas. Like other scales of this design, you can use this one either with or without the supplied non-slip rubber mat. Either way, it’s an easy to clean scale that’s an affordable choice for veterinary practices, pet owners, or small scale farmers who are concerned with accuracy and quality. This scale is an excellent choice for veterinary practices that see small animals. Birds, reptiles, rodents and other small creatures can be difficult to weigh, so the included tray provides a more secure method of placing the animal for the most accurate weigh-in. The animal can be re-weighed immediately after the first recorded weight, without being removed from the scale. The cable attached LCD display provides flexibility in how you set it up, while still retaining a clear reading size. The weight capacity is a large 120kg, the weight graduations are 100g, making this suited for medium to larger weighted animals. With a 20kg capacity, this scale suits most regular veterinary practice needs. The low price will also appeal to home users. Select to display weights in either kilograms or pounds with this scale. Max weight is 225 pounds or 102kg. Non slip surface and operates on 2 AAA batteries. A low cost digital scale that is light weight and easily stored when not in use. This is a large sized scale, with a maximum weighing capacity of up to 330 pounds. The platform is a generous size and completely stainless steel for easy cleaning. The display is large and backlit, and can be wall mounted. Another small scale with a 20kg weight capacity. Suited for small animal practices, or home pet owners. Great for rabbits, birds, rodents, reptiles and other small species. For large dogs and small farm animals. Most dogs love to exercise in some way, but just like us humans, some canines simply need that extra push in the right direction when it comes to getting up and moving on a daily basis. If your dog is overweight or heading that way, then it is even more important to start seriously focusing in increasing their activity levels in order to help avoid any short or long term health complications that can come about as a result of obesity. Every dog is different – some will simply enjoy walking or running on a lead with you (if you’re up to it! ), while others will take more of an interest in playing games, chasing, fetching and even obstacle courses. Whatever motivates your dog to exercise should become the focus of your activity time with him or her. Mixing it up will ensure that your pet never loses interest in exercise time, and it also allows you to choose activities that suit your own fitness level because let’s face it, not all of us are cut out for running a mile or two each day with our dog by our side! If your dog has a condition such as arthritis, then regular exercise can be difficult and painful. This often leads to weight gain as the dog becomes more inactive over time. 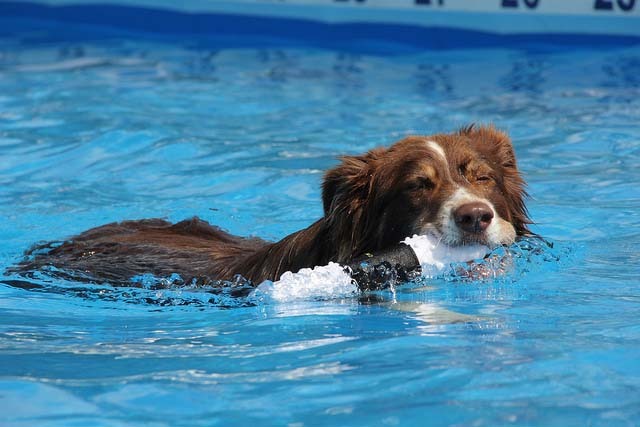 Many healthy dogs love to swim, but those canines with health conditions that affect their movement on land can particularly benefit from exercising in water; otherwise known as hydrotherapy. Even if you regularly take your dog on a walk, there is a good chance that the “social” aspect of this form of exercise doesn’t allow your pet to burn as much calories as she would if she were doing more structured exercise. Stopping to sniff, pee, lay down, chat or any of the other number of distractions that can take place on a dog walk all add up to a generally slower pace and less calories being burned. Whilst any exercise is certainly beneficial, real weight loss will be significantly more achievable once you formulate a much more organized routine of exercising your dog. Because many dogs can have a short attention span, it is important to come up with a variety of exercise ideas which you can rotate through regularly. There is an added bonus to getting your dog on to an exercise plan to shed weight – it will get you (and your family) out and about more and more active yourselves, improving the health and fitness of the humans in the household along with your canine family member! There are many potential causes of both sudden or gradual weight loss in dogs. When a dog stops taking an interest in food all of a sudden and this continues for 24 hours, your vet should be consulted. Underlying medical condition such as diabetes, inflammatory bowel disease, cancer. It is really vital that your dog is checked by your vet, who will likely conduct a range of diagnostic tests, to determine exactly what is causing your dog to lose weight. If you have discovered the cause of your dog’s drop in weight and have been advised by your vet to now work on helping your dog to put weight on again, it’s time to focus on what you’re feeding him and of course, how much food he is eating on a daily basis. There are certainly a range of formulated commercial and prescription diets available that have been designed for weight gain. Below we will mention some of those briefly, but also several other foods that you can prepare yourself at home for your dog if weight gain is your priority. If you have suddenly noticed that your dog has lost a significant amount of weight over a short period of time, then it’s time to act. Severe weight loss in a dog can often point to severe health problems, and acting quickly to diagnose and treat your dog will make all the difference in his or her recovery and long term well being. Ensuring your dog is kept up to date with a deworming program is the first and easiest thing any dog owner can do to remove the risk of intestinal worms becoming a problem. What are some of the possible causes of weight loss in a dog? The list of possibilities is long, and clearly your priority should be to get your dog straight to the vet as soon as you notice that something is not right with his weight. The below list of health problems and complications that can cause anything from mild to severe weight loss range from very serious chronic conditions, to those that are not so serious. Whatever the case however, an underweight dog should always see a vet as soon as possible. Keeping up to date with intestinal parasite control with your dog is important, but sometimes we may have overlooked the importance of these measures, and failed to deworm our dogs on a regular basis. This opens up your dog to risk of intestinal parasites, and it can be difficult to tell until the problem has become serious as the numbers of parasites multiply. 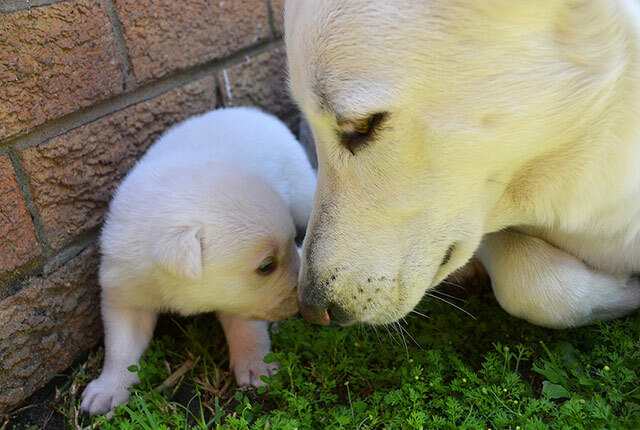 Puppies are particularly vulnerable to worms, but they can infest a dog of any age. Serious intestinal parasite infection can result in weight loss, which can become severe if left untreated. There are a whole range of health conditions that can cause a dog to lose weight. It is impossible to determine what medical condition your dog may have, so the best course of action is always to see your vet so that diagnostic tests can be undertaken. Some of the wide range of possible causes of weight loss in dogs can range from infections or disease of the bowel, pancreas disease, liver problems, diabetes, hyperthyroidism, Addison’s disease, viral or bacterial infections, cancer, and more. How will your vet diagnose what is causing your dog to lose weight? The recommended tests will depend upon what your vet believes may be the likely problem. It is however possible in some cases that more than one type of test might need to be undertaken in order to pinpoint the exact health issue – costs of these tests should be discussed with your vet so that you are aware of any budget concerns, and of course, any potential stress and impact on your dog. In some cases your pet may need to stay overnight at the veterinary hospital, and your vet will advise you of their professional opinion on what is the very best option for your dog. Entire books and scientific texts have been written around dog nutrition. Exactly what our dogs should be eating for optimal health and weight is always hotly debated and comprised of countless opinions, studies, facts, myths, and everything in between. At the end of the day, what you feed your dog is your own personal choice, and if you have a dog that is overweight, then you have an opportunity to learn and improve your pet’s health by making food choices that you may be able to see the direct consequences of – ideally in a positive way! Before you start changing your dog’s diet as part of his or her weight loss journey, gather more information by determining the specific information about your particular pet that will help you greatly in working out just how much weight you would like your dog to lose, and how to go about making it happen. Once you’ve decided (perhaps in consultation with your vet) that your dog does indeed need to lose weight, where do you start? Nutrition is of course going to be an important focus from now on. Before embarking on any new eating plan for your dog, it is important to have your veterinarian conduct a health examination to determine whether there are any underlying complications or diseases which can come about as a result of prolonged obesity. Your vet can then advise if there are any particular foods that your dog should or should not be eating, and whether any medications are required to treat serious conditions such as diabetes. The age that your dog is considered to be “old”, or a senior, depends upon his or her breed. Some breeds have a lifespan of only 8 or 10 years on average, whilst others may easily reach 15 and beyond. In general, smaller breeds have a longer average life span, and this decreases for larger breeds. Ultimately, each individual dog will differ however, and certainly those that are not pure breeds can be even more difficult to assume an expected lifespan for. Whatever the case, once your dog starts to show signs of aging, weight loss can be one of the more noticeable and concerning issues to address. While obesity in older age is a common issue in dogs due to their reduced physical activity, some animals have the opposite problem: they lose weight. Unfortunately, this kind of weight loss can often indicate a health issue rather than just being a sign of aging. Some older dogs may become more fussy with their foods as their smell sense reduces. So they may simply be eating less and losing weight. If you suspect this is the cause of your dog’s weight loss, it is relatively simple to attempt to fix by encouraging the consumption of other foods, including more aromatic home cooked meals. Poor dental health in older dogs can also lead to them losing interest in food, or simply finding it painful to eat. If your dog is off their food for no apparent reason, having your vet check their teeth and gums is a wise first step. Diabetes, liver disease, gallbladder disease, kidney disease, cancer, and heart disease are all conditions that can cause weight loss in dogs. Your vet will be able to examine the symptoms in your dog and from there, map out a diagnostic plan for determining exactly what is causing the loss of body condition. Most commercial pet food brands have “senior diet” products available. If you are considering switching your dog on to a senior diet, do it slowly and gradually, rather than changing their entire diet overnight. It is important to remember though, that there are other options when it comes to the nutrition of your older dog, and many people debate the effectiveness or benefits of commercial senior dog foods. How do you know just how much to feed your dog each day? Over feeding or under feeding your dog can and will bring about health problems at some point. And once you have reached the point of your dog appearing underweight or overweight, drastic action needs to be taken to correct it. Ultimately, it is always ideal to feed your dog properly and avoid these weight issues appearing at all. If your dog is already overweight, you must pay close attention to serving sizes. This can mean measuring the exact amount of food provided at each meal, and not allowing your dog access to snacks or table scraps. Your pregnant dog will gain up to 20% extra weight over the term of her pregnancy (around 60 days). It is important however not to over feed your dog whilst she is pregnant as this can lead to her becoming obese after the pregnancy is over. It can also bring about difficulties during labor and poses a higher risk for the puppies. It is during the third trimester (day 40 onwards) that your pregnant dog will require the most food as this is the time that her puppies are developing quicker and larger, bringing about extra stresses on the mother. You will particularly start to notice your female dog’s size growing noticeably in the last three weeks of pregnancy, when her abdomen starts expanding to its maximum for the growing puppies, and her mammary glands begin enlarging with the production of milk. Your pregnant dog can and should still undertake mild exercise during the first half of her pregnancy, so she maintains her muscle tone and a healthy weight. A daily gentle stroll during this time is adequate. However she should be avoiding any heavy exercise during the latter stages of her pregnancy. The diet of a pregnant dog is of high importance to both the health of your dog, as well as her puppies. An ideal diet will result in a dog being in the best possible shape to carry and give birth to strong, healthy puppies. Attention to nutrition does not stop when the pups are born however; the process of lactation puts extra stresses on the mother dog’s body, and she certainly needs to be eating well in order to remain strong and healthy during this time and of course, to produce top quality milk for her puppies. Large dog breeds may have up to 12 puppies, or as few as 8 or less. Smaller dog breeds will typically have much smaller litters ranging from one to four pups.